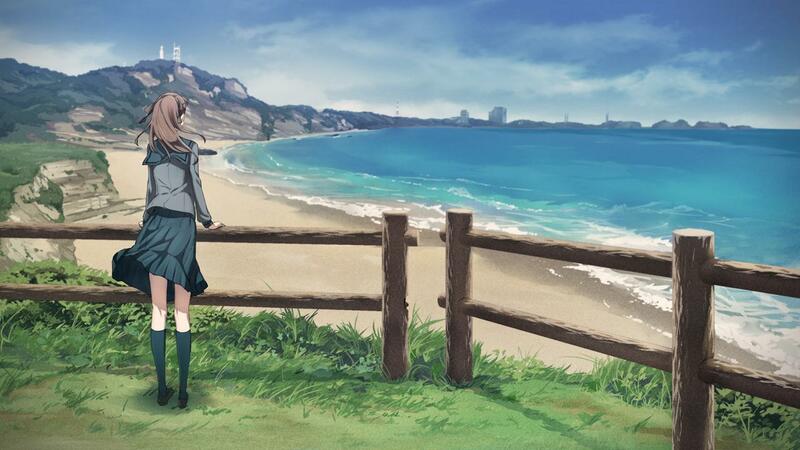 Disclaimer 1: While Robotics;Notes might be mostly known for its anime adaptation in the west, please don’t forget it’s based on a Visual Novel. An anime can only adapt such a limited amount of scenes from a VN that it’s always a pain comparing both mediums. Production I.G. managed to cover the Visual Novel events in an acceptable way, but the show is obviously missing out on a lot. 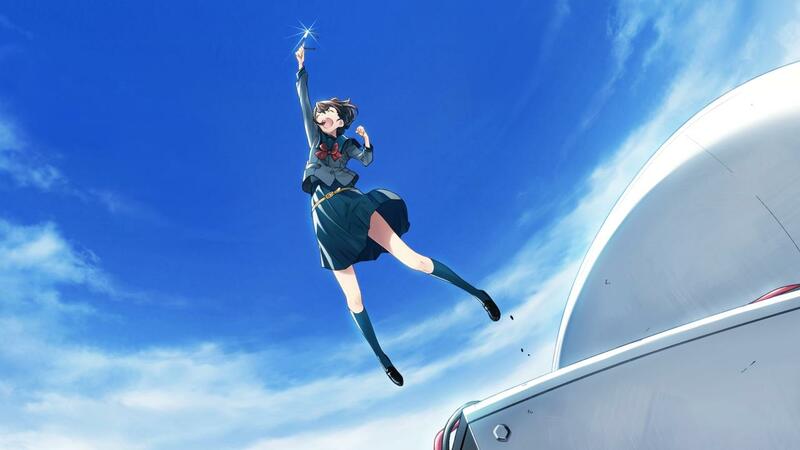 This review is written with Robotics;Notes in general in mind, so I’ll not foccus on adaptation flaws or where the anime could assumedly have been more faithfully. However, I will add my own opinion on it at the very end. As you might notice in this article, I sometimes refer to Science Adventure, or short SciADV. In case you aren’t familiar with it, SciADV is a series consisting of several interconnected Visual Novel titles, including the overly popular Steins;Gate. Everything started back in 2008 when Chaos;Head came out, and one year later Chaos;Head Noah as a completed, improved release of the original. While Chaos;Head itself focused on the so-called “delusional science”, its concepts layed out the base for all of the later SciADV titles. 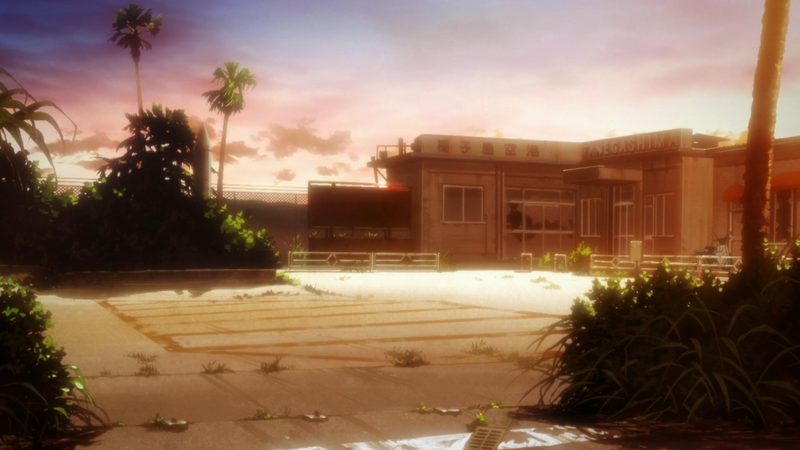 Steins;Gate came out in 2010, and by being advertised as “Hypothetical Adventure” it didn’t only focus on time travel, but picked up on aspects from Chaos;Head as well. Devices such as the time leap machine or Amadeus are based on Chaos;Head technology for example. Then, the only recently localized Chaos;Child is a direct sequel to Chaos;Head, builds up on its story and develops concepts even further. 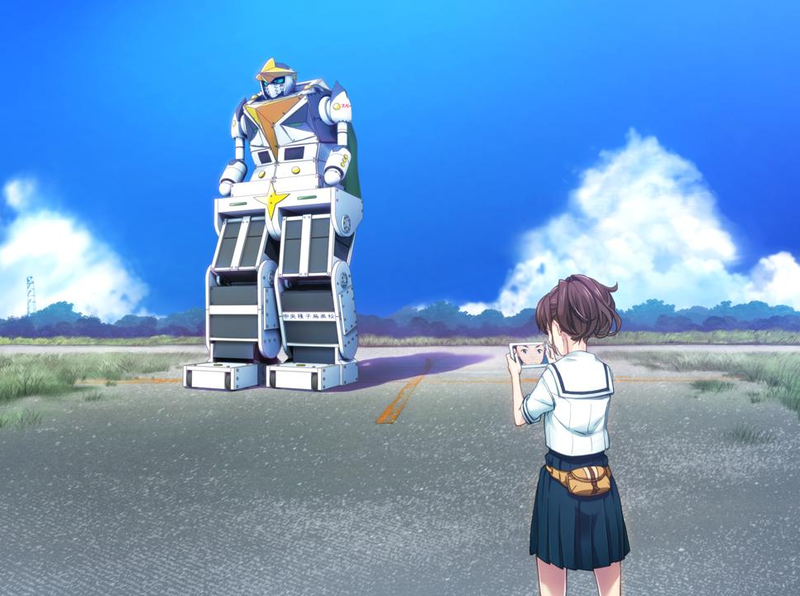 Robotics;Notes entered the big picture back in 2012, along with an anime adaption produced by Ghost in the Shell’s Production IG at the same time as the Visual Novel. 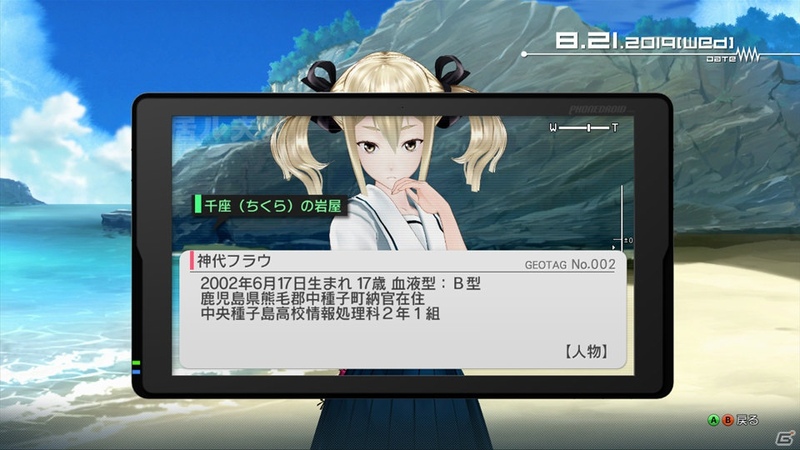 Two years later an improved edition called “Robotics;Notes Elite” was released, adding 3D models instead of character sprites as well as animated cutscenes. Throughout all of SciADV there’s a main antagonist called “Committee of 300”, referring to the real-life conspiracy theory by the same name. Already being an important player in Chaos;Head, it continues to be present in Chaos;Child, Steins;Gate and Robotics;Notes. 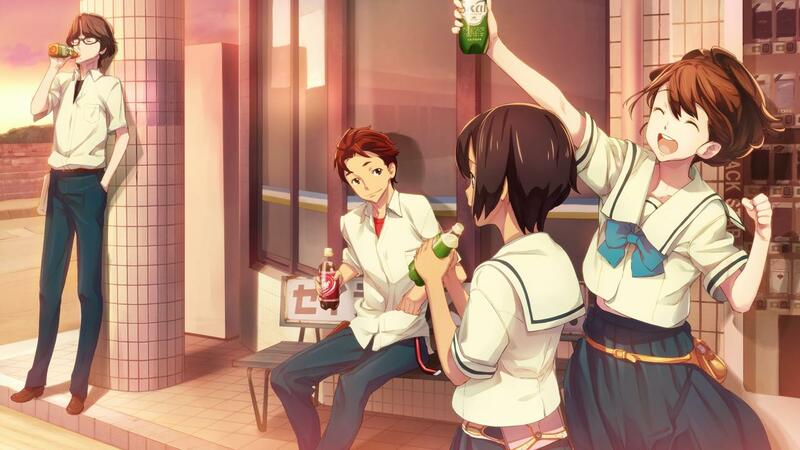 Of all SciADV titles the Robotics;Notes Visual Novel also happens to be the one which contributes the most to the committee lore. 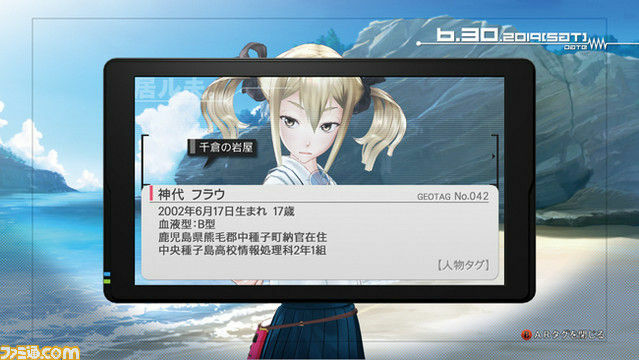 In January 2019 SciADV received its newest entry as a sequel to Robotics;Notes. It’s called “Robotics;Notes DaSH”, and as the suffix implies it adds Daru to the cast. First and foremost it’s a direct sequel to the original Robotics;Notes, but also a crossover title between all previous Science Adventure titles. Therefore it has even more references to Steins;Gate and Chaos; than its prequel, and still continues to rely on their established concepts. Weakest – but not weak. “Reading Steiner” is not only an important term for Okabe in Steins;Gate. It also refers to the online handle of Andrew Hodgson – one of the Visual Novel’s translators. Besides the main game, he translated uncountable amounts of side-content to Steins;Gate and other titles from the franchise it belongs to, namely “Science Adventure”. 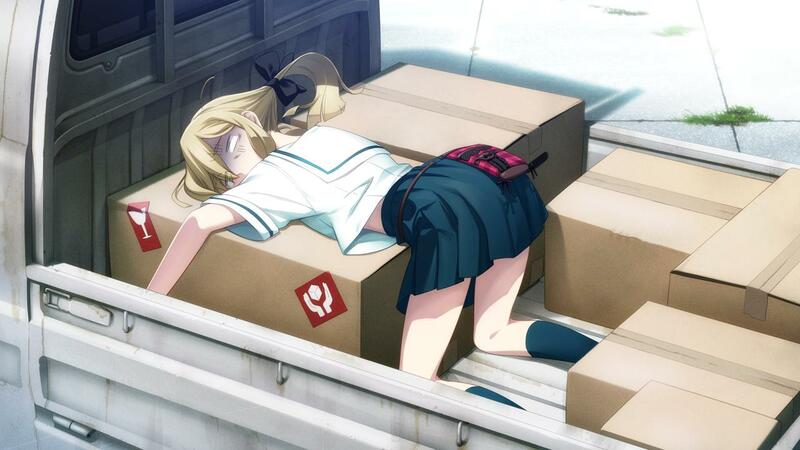 So yeah, Robotics;Notes. It’s that kind of title I personally always pushed back further and further. And that tweet was ironically amongst the reasons for my lack of interest. While Steiner explicitly stated ‘it’s not a weak title’, in combination with certain images I saw here and there, and hearing about how overly cheerful the story is supposed to be, the words ‘weakest title’ always kept me off. And well… It surely is offering a somewhat more “happier” and “brighter” plot than you might expect from a part of the series. You’re worried, unsure about what to expect? Especially after Steins;Gate or even more Chaos;Head and ;Child almost got your favorite titles because of their more serious parts? 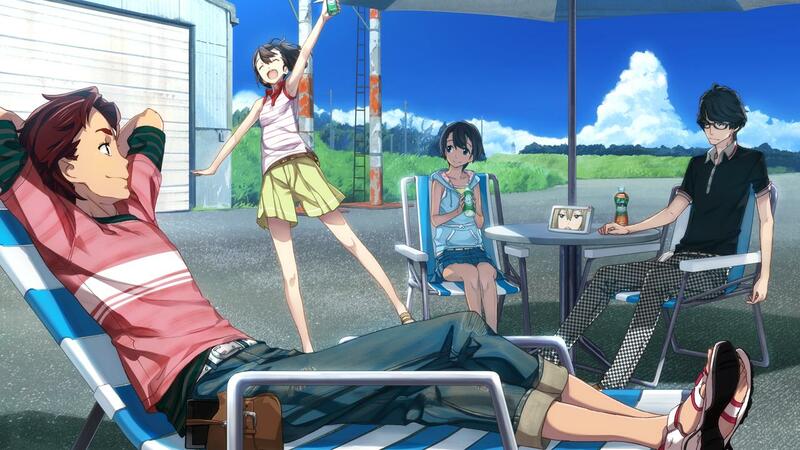 In that case you would be more than a fool to expect Robotics;Notes to be a straight out Slice of Life story. …still dive into a fairly dark, twisted plot. …still investigate a conspiracy theory. …still encounter the Committee of 300. …still be reminded of concepts shared amongst all SciADV titles. In case you’re aware of the Chaos;-titles, the last point might be of particular interest for you. It’s especially true for Chaos;Head, because both titles are related in more ways than one. And there’s a lot more in for you than just a few references. But yeah, let’s stay objective and somewhat grounded: Yes, Robotics;Notes also features a good amount of lightweight themes and situations. Now I’m not sure how sensitive you are about such stuff, perhaps you don’t even mind it at all and want me to finally shut up already. However the story isn’t just trying to be happier for the sake of being happy. While it attempts to build characters, next to motives and personalities, focus is especially given to how their dreams manifest as “GunBuild” slowly becomes reality. The generally lighter mood helps expressing those feelings a lot, and it would be absolutely unfair to describe it as ‘unfitting’ or even ‘weak’. The reason why I’m penetrating that point so much is that it’s a common point of criticism when comparing Robotics;Notes to the rest of SciADV. Having been invented as last of the franchises‘ three settings, especially after two already successful prequels, a lot of people appear to be disappointed because it didn’t turn out to be “Steins;Gate 2” or “Chaos;Head 2”. 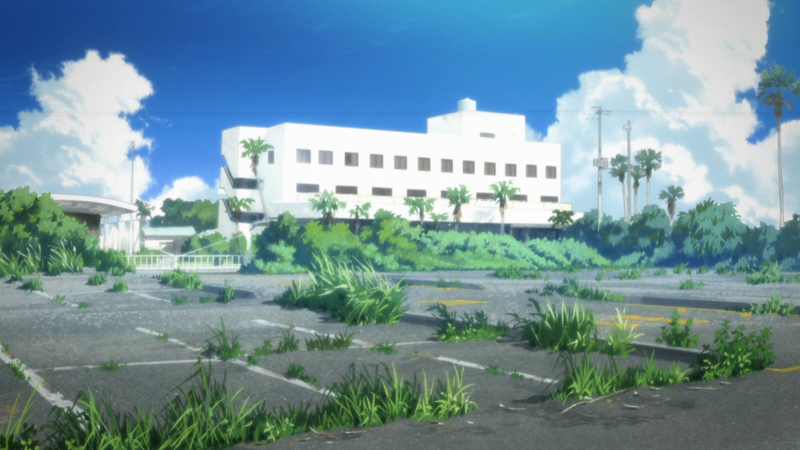 However, Robotics;Notes builds up another world, far away from the ‘hypothetical’ Akihabara or the ‘delusional’ Shibuya. And simply because it’s a bit more lively, and perhaps a bit more cheerful, doesn’t render it inferior to the already established ones. So why not give it a chance as well? 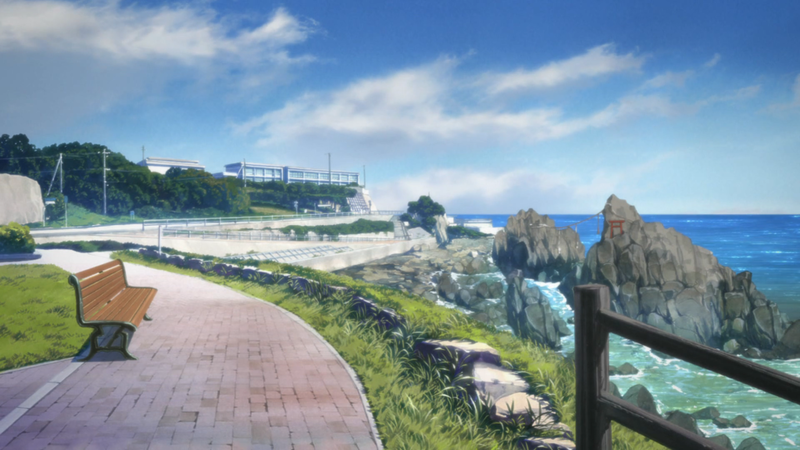 Contrary to the urban setting of Steins;Gate and both Chaos;-titles, Robotics;Notes is set on the small island Tanegashima, which is located in the southern area of Japan. The story is actively trying to bring in some fresh air, as many scenes are set in a rather natural environment. Not only does that affect vegetation in a lot of the more urban areas, the ocean is also close-by and relevant for various scenes. 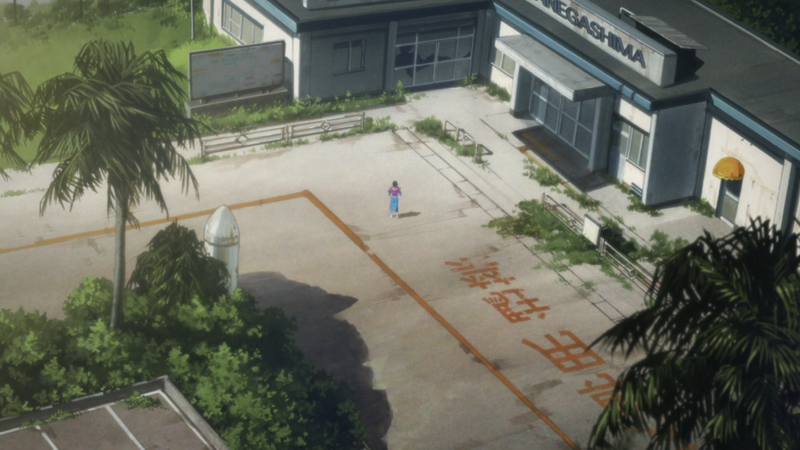 On top of that, some locations such as the Tanegashima Space Center, or even organizations such as JAXA, exist in real-life as well. Time-wise it was supposed to happen in a year which is now present – 2019 – where Augmented Reality technology spread to a lot of handheld devices. Nearly each character owns one of the so-called PhoneDroids (or „PokeComs“), which are basically tablets running what we know as Android operating system. 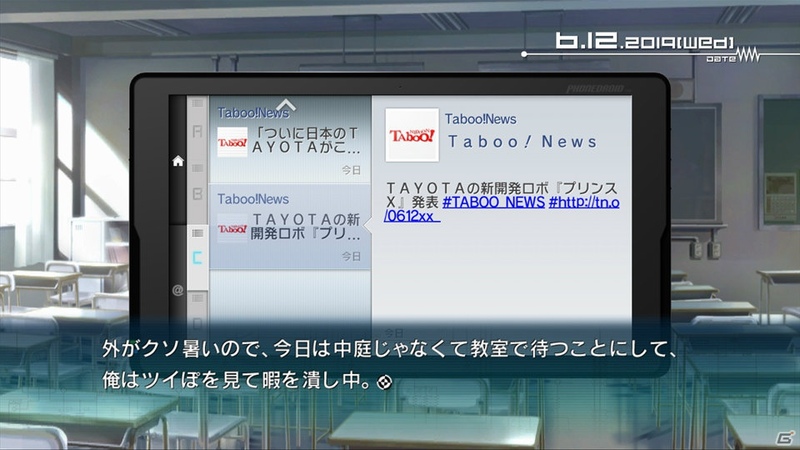 Similar to how it is in Steins;Gate, a player of the Visual Novel is able to use said device to browse Twipo (the in-universe Twitter) or open a map application („Deluoode Map“). An important part of the whole story, and especially the novel, is also an app called IRUO. 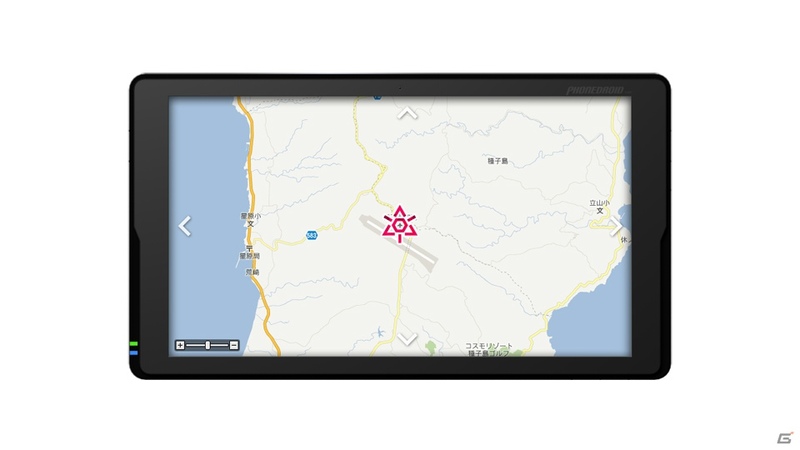 It can be described as a multi-purpose Augmented Reality interface, which allows the user to see, add and interact with notices, advertisements, geotags, event triggers and so on. It’s used a lot throughout the plot, and even allows you to actually examine the environment in-game. For example, it’s possible to read up informations tagged on characters or objects. …and what is it about? 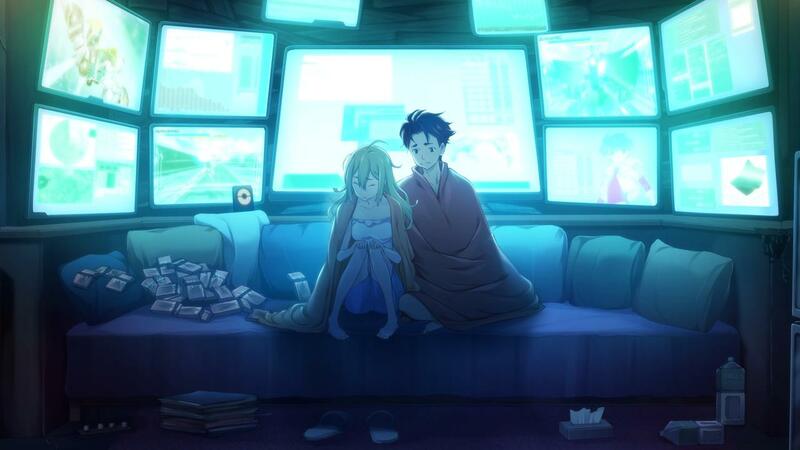 As for the story: In some reviews I saw Robotics;Notes presented as a story about building a robot. Period. Well, that statement is not wrong at all. 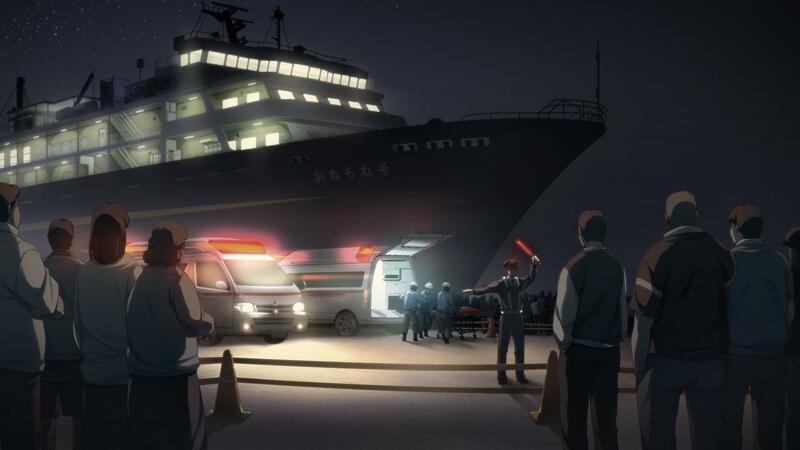 However it’s absolutely unfair to just omit the fact Robotics;Notes also focuses on a conspiracy theory as backing. That one brings in a lot of increasingly thrilling, shady elements and is more than equally important. As stated earlier, it’s still a fully fledged entry in the SciADV series. As it is in all SciADV titles, the main protagonists are several students. Senomiya Akiho and Yashio Kaito, or short Aki and Kai, are members of their school’s “Robotics Research Club”. While Kai isn’t especially interested in robots, he joined at the request of Aki’s sister Misaki. Since Misaki decided for a career at mainland-based company „Exoskeleton“, she left Tanegashima right after graduation. Being worried about Aki, she especially entrusted her to Kai with regards to her Elephant-Mouse-Syndrome: A blackout in stressful situations, causing Aki to see her environment “fast-forwarding”. Misaki’s confidence in Kai isn’t all that far-fetched, because he himself suffers from the opposite version of the very same syndrome. Instead of fast-forwarding though, he perceives everything in slow-motion. Both developed their syndromes several years ago, after a mysterious mass fainting on a ferry with the name “S.S. Anemone”. The overall plot focuses on Aki’s intention to work on a huge robot, namely “GunBuild 1”. Its blueprints and initial construction origin from Misaki herself, however in the end time worked against her. After her graduation a half-finished GunBuild remained covered in a hangar, which served the former club members as headquarter. Pulling off the tarp from her sister’s dream, Aki almost feels pity for the enormous, humanoid robot. And so, being the only club member besides Kai, she puts in her best efforts to avoid its looming shutdown, and to find new members to finally conclude work on Misaki’s “legacy”. As time passes, Kai starts hearing a recurring static sound from his PhoneDroid Pad. It always follows the same pattern: A few short beeps, and then – white noise. And it doesn’t stay like that: It’s not long until he even hears voices from the device’s speakers. Still lacking interest for Aki’s GunBuild project, he begins investigating those phenomenons. The more he dives into them, the more it turns out there is something strange waiting for him inside IRUO. As a result, Kai is being dragged into an odd game. Its rules require him to “clear flags” by successfully solving quests put up within the AR application, so as to slowly walk down the path of a veiled truth. About which, each time a quest is solved, small pieces of information are revealed to him. Left to right: Subaru, Kaito, Junna, Akiho. Frau is not present here. The main cast consists of five persons, and two additional ‘mystery girls’ who better remain unexplained during this review. It may be revealed one of them originates from Steins;Gate though. The female part is made up of Akiho, Junna and ‘Frau Koujiro’, whose strange (and partially german) name corresponds to her online-handle. As for the male part, we should mention Kaito as the main character and least but not last Subaru. The story mostly focuses on Kaito and Akiho, who drive the plot forward. So I want to give a short reflection on at least the two of them, and Frau as well. …she probably is the most energetic person amongst the club’s members. It’s her who continues to push the team forward, so as to reach her final goal. Her motivation is entirely rooted in her ambition to live up to Misaki, and so finishing GunBuild turns into her one and only dream. Even as severe problems arise, she isn’t willing to drop her sister’s construction for the sake of starting from scratch again. Her personality contrasts with Kaito’s one a lot, which also isn’t very healthy for the two of them right at the beginning. It’s not before the club gains its remaining members that Kaito and Akiho are able to spend their time sperate from each other, giving Akiho the possibility to follow her dreams more passionately. …is a character who vastly lacks interest for robots, and neither of Akiho’s powerful speeches is able to change that. In fact, the only interest he ever has on the matter is ‚Kill Ballad’, a mech-focused fighting-game. He invests a lot of his time into it, becoming a fairly good opponent for many. 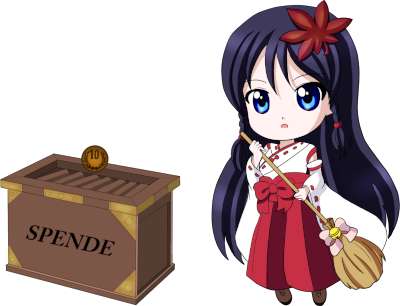 As result, he often depends requests on Akiho’s behalf on whether she is able to beat him in a battle, which ultimately leads to her giving up. Personality-wise Kaito is therefore a rather relaxed, and partially also sarcastic person. Due to his laid-back nature he sometimes doesn’t hesitate at choosing the easy way out by cheating and also reaches levels where he can be quite manipulative. Despite all of that, Akiho is still turning to him whenever she requires support for a difficult decision to make. Several times throughout the whole plot Kaito brings her back on track again as she is in desperate situations, which shows a lot of Kaito’s character appears to just be facade. …however she is referred to, is presented as a rather anti-social person right from the start. She was the main developer of Kill Ballad, and spends the majority of her time as a shut-in, locked into her apartment. As a result of her life-style she frequently uses netspeak expressions, refers to Japanese memes and lacks even the most basic social skills. A lot of Kona’s interest is also dedicated to the in-universe anime ‚Gunvarrel’, leading to her not treating persons kindly who talk poorly of the show. Her personality rapidly shifts between bored aloofness and erratic excitement, which is often filled with loads of pervertedness. In a certain way, Kona might be seen as a female Daru, however she’s a lot more emotional as character. As she’s easily exaggerating, Kona tends to be quite insensitive at times. Such traits even caused Kaito, while normally being fairly calm, to snap at her after she called his Elephant-Mouse-Syndrom an anime cliché. Takeshi Abo, as the main composer behind all SciADV titles, described Steins;Gate’s music as “cloudy” and Chaos;Head’s music as “rainy”. 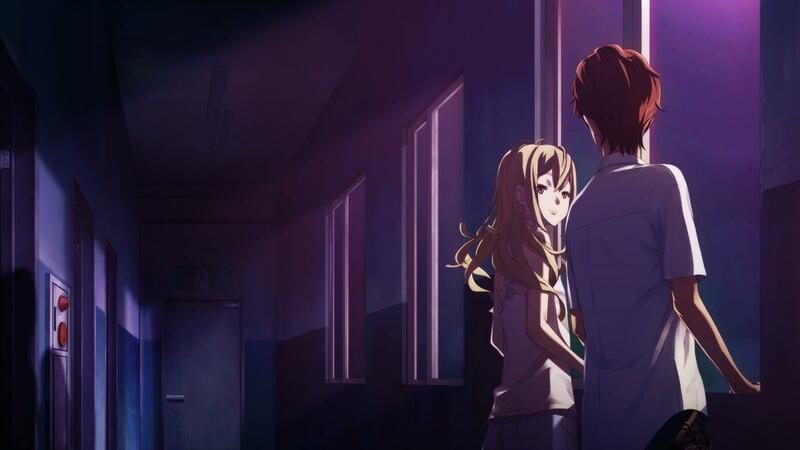 While everyone might come up with their own images about the general mood in both games, I think Steins;Gate portrayed a clean, scientific soundscape while Chaos;Head obviously attempted to capture feelings of fear and anxiety, along with the literal feeling of being ‘deluded’. Robotics;Notes’ visual core elements are mainly “huge, complex machines” (read: robots), as well as irradiation and radio waves along with a conspiracy feeling. Especially with regards to the fact it focuses on robots, Robotics;Notes attempts to bring in a fairly cinematic, symphonic soundtrack. It perfectly blends with the mech-focused scenes and is a nice alternative to the more synth heavy soundtracks of Steins;Gate and especially Chaos;Head. Imagine a person climbing up on a swaying tower in the midst of a typhoon. Or the jarring, creaking sound of an enormous robot collapsing. Those scenes accompanied by sharp violins, the threatening sound of a rumbling bass and the violent beats of drums. 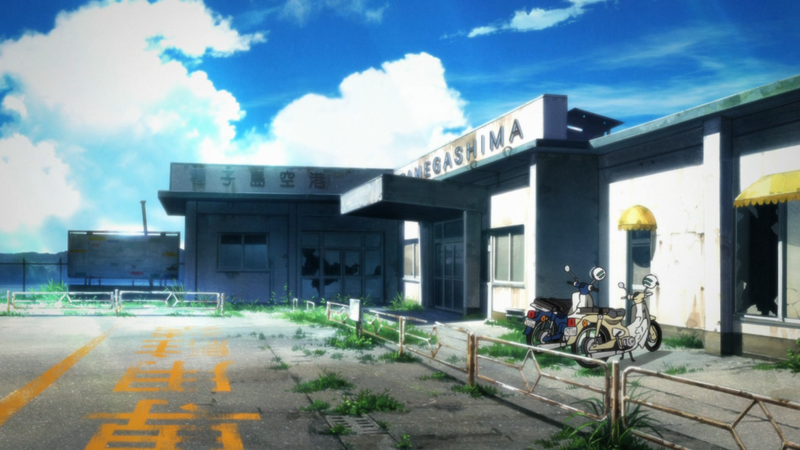 The OST easily allows more colossal and impactful scenes to take place, of which we have quite a lot in Robotics;Notes. As an example, listen to “Hajimaru Houkai” – which essentially translates to “Dawn of Collapse”. Opening- and Ending-wise the adaptation feature’s two different songs respectively. Notable ones are „Junjō Spectra“ (the first opening) by Zwei as well, and „Topology“ (the second ending) by well-known SciADV singer „Kanako Itō“. Especially for the ones interested in the relation to Chaos;Head, I recommend paying attention to the lyrics to Junjō Spectra. The following content won’t spoil you unless where explicitly marked as spoiler. However it partially takes away the general directing of the show. You’re free to skip it if you’re worried. First of all I want to say that the anime adaptation was decent, and overall I think Production I.G. managed to produce an enjoyable show. I also want to state, however, that I personally was unable to read the VN, as I simply don’t know Japanese. 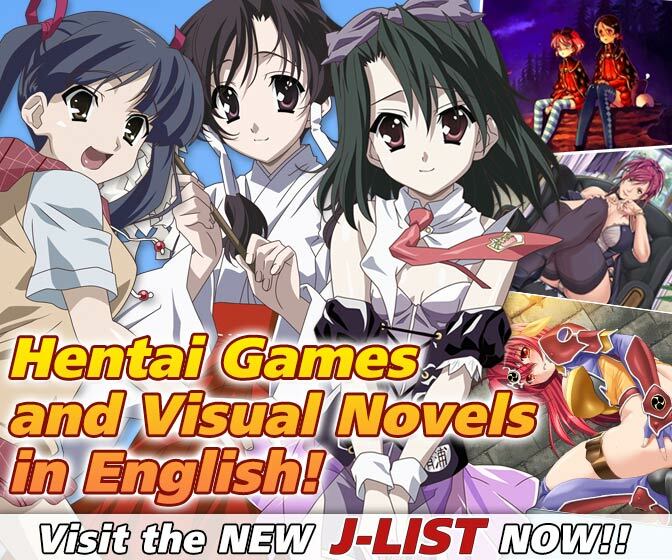 That’s why I’ll solely reflect on what my experience with the anime was, and what I’m aware of about the Visual Novel. I’ll also argue based on the Steins;Gate subreddit, as it features a wiki which a good amount of effort was put into and I trust the ones responsible for it. While being critical, I neither intend to, nor consider it justified to degrade the anime as „failed“. It’s still a good show, despite all its flaws. The Visual Novel is organized in so-called “Phases”, which appear to be the chapters. As far as I’m aware of, the first few phases were adapted rather faithfully and the debatable part is mostly the second half of the show. From my viewpoint, I definitely felt like the beginning and generally the first half was also a lot more consistent in mood and pacing. You were slowly exploring Tanegashima, and over time the robot arc as well as the conspiracy arc made progress. At the end of each episode you felt like you moved forward a bit. No matter if it was just due to GunBuild being one step closer to completion, or new pieces were added to the Kimijima-puzzle. Characters were introduced, partially developed and felt relatable over time. 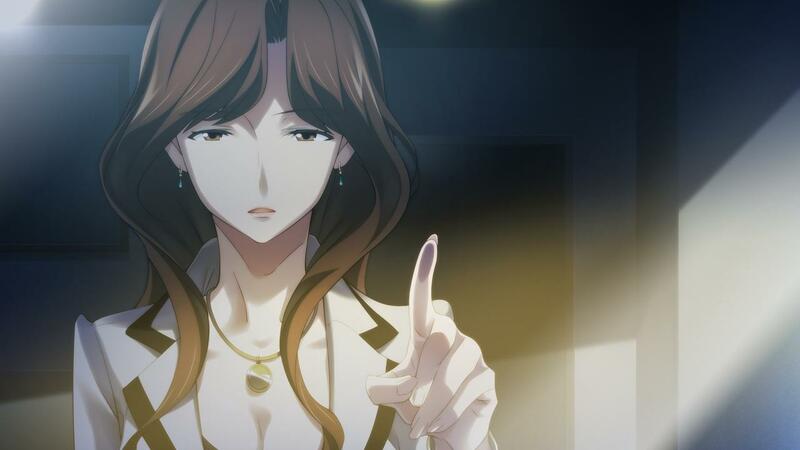 Personally I was surprisingly satisfied with the direction, and I didn’t feel like the story was unnecessarily rushed (as far as I’m allowed to say that for a VN-adaption, that is). This however changed in the second half. The more the story progressed, the more the backing mystery took over the plot and finally lead to several “character focused” episodes. Those focus on Junna, Frau and finally <Mystery Girl #1>, and while they give those characters some vital background information, they also throw you out of the momentum a bit. Suddenly you feel like GunBuild isn’t even important anymore, and even though as substitute the committee lore is picked up in a lot more detail, these episodes felt like shoehorned-in character routes. On the other hand it’s also unfair to not give the anime credit here, because in my opinion some of those were directed quite well. While the first one (Junna) might still count as filler, it’s safe say <Mystery Girl #1>’s one was quite good and especially the 1 ½ episodes focusing on Frau were probably one of the best parts of the anime. Her character is given some more serious treatment here, which came rather surprisingly. While her personality was somewhat entertaining, she was mostly degraded as necessary evil up until this point. However, the show manages to actually make you care about her, which also happens in a rather sincere and faithful manner. This even comes along with apparent character development, and felt like it should render Frau a bit more relatable. Unfortunately the aftermath only kept on throughout the following episode, and afterwards Frau was very quickly pushed out of focus again. I really wished for her to stay more relevant personally. Kai – but who is he actually? Another legitimate point of criticism is particularly Kai’s characterization. While the Visual Novel might have been able to express his thoughts as well, we lack those in the anime. The result is more often than not still an empty shell, which makes him seem needlessly naive. Carelessly pushing unknown buttons, without wasting a single thought on the consequences is just one example. Other ones include the limited insight into Kai’s feelings for other characters, most notably for Aki. Particularly since Kai is the main character, such thoughts would make it easier to relate to him. The N IV device essentially sends out the same radio waves which were already radiated back at the Anemone incident, and caused Kai to experience his slow motion effect. Information on how to create them was stored on the cartridge ejected from the EGI-System, so that’s why it is necessary to be plugged into N IV. Kai simply reacts to those waves, which again push his visual perception out of sync. Instead of an official Robotics;Notes localization, the former publisher PQube brought over Steins;Gate Zero and Chaos;Child. Both of those were highly anticipated titles, and rather obvious choices for localizations of the SciADV franchise. After MAGES. transferred partnership over to North American publisher “Spike Chunsoft”, Steins;Gate Elite and Linear Bounded Phenogram received a western release as well. As far as Steins;Gate goes, the only somewhat significant title left is “Darling of Loving Vows”, a comedic spin-off Visual Novel. It might be on Spike’s list, but its priority is rather questionable. So at this point we might expect another part of the SciADV series to be picked up by Spike Chunsoft and MAGES. for a release in the west. And realistically seen, the only relevant ones would be Robotics;Notes Elite or Chaos;Head Noah. (Robotics;Notes DaSH is too reliant on its prequel to be localized as standalone, even though it might appeal to Steins;Gate fans a lot more due to Daru being in the cast.) 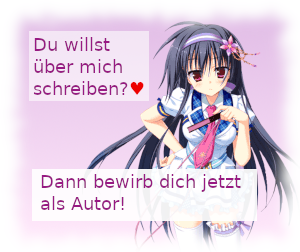 By now, it’s also no secret anymore a group of translators around Reading Steiner translated Chaos;Head Noah in an official capacity years ago. Unfortunately the translation was never released, as the game was judged as ‘too old’ by MAGES. CEO Chiyomaru Sakura. And this is exactly where Operation HiddenHand comes in. It started as petition meant for Spike Chunsoft and MAGES. 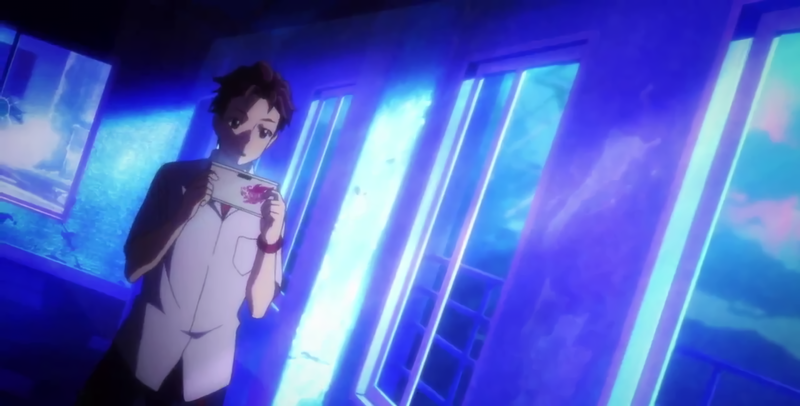 to bring Robotics;Notes Elite and as secondary thought also Chaos;Head Noah to the west. Both companies involved stated on various occasions that localizations would be considered depending on the interest, and on last year’s GDC an official announcement by Spike hinted that Robotics;Notes might be included amongst future, localized SciADV titles. 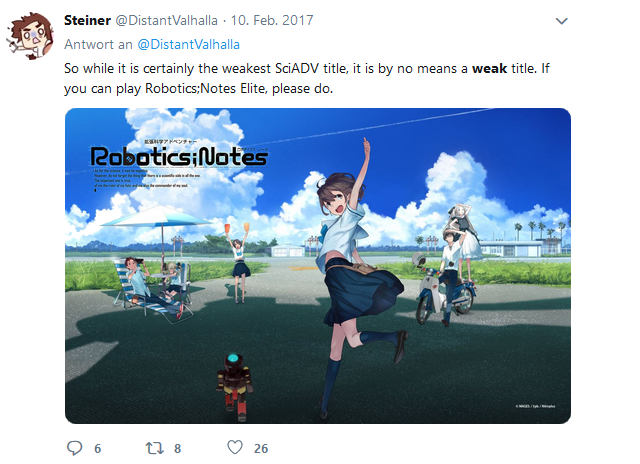 Ever since late 2015 I've been following the Science Adventure series, and recently decided to write up an article about the weakest, yet not "weak", entry of the series: Robotics;Notes.